In a world that seems full of “fake news,” Tweets and distractions that have no substance in our current state of affairs, there can be much joy in reading about simple living, written in a straightforward style with wonderful cartoon illustrations. You don’t need to be desirous of moving “back to the land” or only eating food you grow yourself to thoroughly enjoy this book by Robert Inwood & Christian Bruyére. 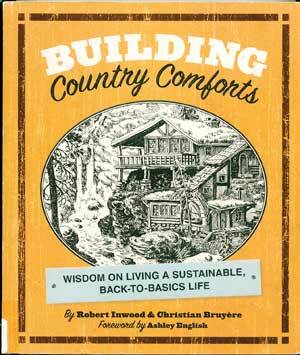 At over 400 pages, Building Country Comforts is actually a collection of two books published in the 1970s, In Harmony with Nature and Country Comforts. Broken down into project themed sections, each is laid out with basic ideas and techniques needed to fulfill the goal. Sections include: Plant Shelters, Gardening & Outbuildings, Water & Animal Shelters, Stone Structures & Blacksmithing, Heating Structures & Root Cellars. In each section, there are chapters about how to tackle the subject in different ways. All in all, enjoyable and thought-provoking. The idea of self-sufficiency, on some level, is appealing, even if it exists only in your mind while paging through this book. Originally $19.95, now as a remainder, only $14.00.